Certain good ideas lead to properly-organized and well-attended ‘successful’ cultural events. This could be applicable to creating good organizations also. I write below from my experience of organizing a few big house-full South-Asian cultural events at MUM over the last 12 months. All the events had the customary song and dance elements. However, they also had new innovations. And they all brought in new challenges, opportunities, surprises and joy. It takes a certain gut-strength to manage it all. Diwali function in November 2013. We created a beautiful innovative poster to promote the event. We introduced the idea of including participants from all South Asian countries including not only India, but also Nepal, Bangladesh, SriLanka, Pakistan, and others. We introduced the idea of a fashion show where all students could showcase their traditional dresses. We introduced the idea of a boy-girl pair of MCs, where the MCs were from different nationalities. We invited the Mayor of the city to the event, and he got the flavor of how important Diwali is for the entire South asian community. We introduced the idea of giving free organic Burfi Prasad to all the attendees. Last but not the least, we kept the event free to the public. The program was wonderful, and the event was a big success. (Pictures courtesy: Craig Shaw). Holi function in March 2014. We introduced the idea of a poetry recitation which is a Holi tradition in India. In this case, I did the recitation of a humorous old poem. We introduced the big idea of doing a large bonfire which is a Holi tradition: Students continued to sing and dance around the fire till midnight. We played with gulal (colored powder) in the night around the fire. We provided free munchies at the bonfire. We introduced the idea of a bhajan band, and this band continued playing at the bonfire also. The event was a super success. 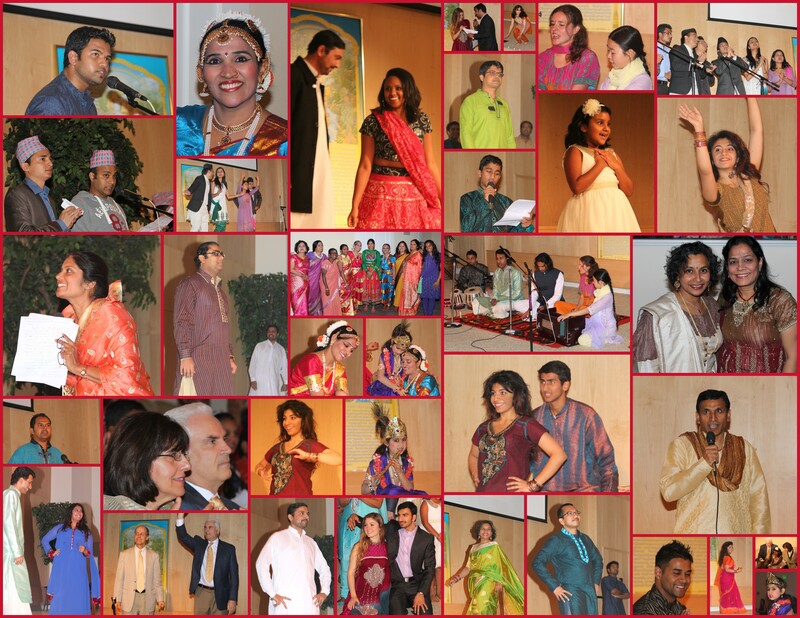 Baisakhi/Ugadi/Indian-New-Year event in April 2014. Coming soon after the Holi event, it was a low-key event. 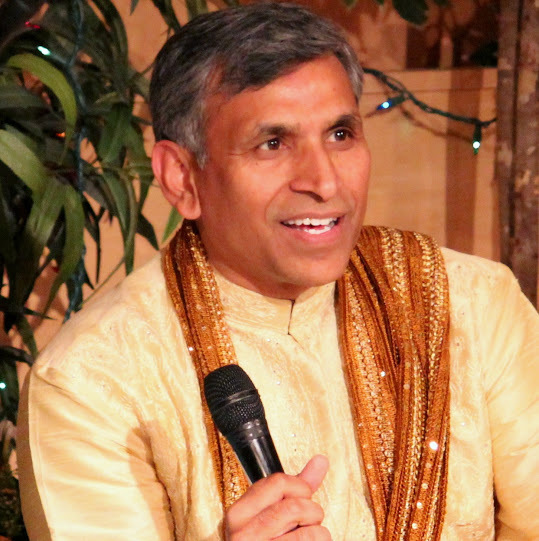 We invited the visiting head of the Maharishi movement in India who was visiting the US at that time. My daughter performed at the event. Krishna Janam Ashtami event in August 2014. This also worked as a welcoming event for all the new and returning students. We continued the ideas of a MC pair, free burfi Prasad, and a large bonfire. We introduced the idea of playing a Maharishi knowledge tape where he was talking of the significance and power of Lord Krishna. We invited the President of the university; he liked the event and said we needed more of such things to enliven the campus. The event was a house-full and standing room only performance. Garba dance party in September 2014. This was a dance party for people to dance to traditional Indian garba music. We brought the Dandiya sticks for the dance. At this event we also discovered our new student president of the South asian club. Diwali event in October 2014. This event used many of our previous ideas. We had the usual Bollywood song and dance shows, an MC pair, a large bonfire, a fashion show that now included people from Africa also. We added a professional Gandharva performance to the event. I led a group bhajan performance. People stood up and joyfully sang the Aarti together. This event was so packed that latecomers could not find space to get into the auditorium. Commitment: Someone has to hold the flag high. Even when no one else is interested or seems to be ready to contribute, the key organizer must love the idea, and should have complete faith that the event will happen, and well. There were moments when there was no one else who came to the event planning meeting. Self-sufficiency. One should be prepared to invest your own time and resources to make the event happen. One should have the talent to sing and dance, or have your friends and family participate as needed. One can usually find the talent, strength and resources within oneself. Openness: Be open to surprises. Be open to what might actually happen at the event. Do not get stuck in a preconceived notion of a cultural event. Be open to new ideas from unexpected sources. Be open to support from unexpected sides. Totally different people, faculty or students, pitched in to support each of the events at crucial moments. Later in the year, we found consistent support from one like-minded person on campus. Integrity: Make sure every event has integrity at a high level. The higher level idea should be to have fun, or whatever else. Do not get caught in the weeds of this item or that, this performer or that, this issue or that. Gradually the reputation will grow and people would love to attend the events. Fire is a primal element. ‘Agni’ (or fire) is the first word of Rik Veda; and contains the structure of the entire universe within it. Fire is also a dangerous element. It can burn and destroy. It can reduce beautiful and valuable things into ashes in no time. It can change direction easily with the blowing of the wind. Fire can leave scars that last a lifetime. However, it can also create impressions that last a lifetime. Fires are used for religious and cultural purposes. Sanatan dharma believes in using sacred fire (as havan or homa) to purify the spirit. Fire is used as a witness to an oath. Fires are burned for cultural activities, e.g. Holika Dahan. On Dusshera (or Vijayadashmi Day), fire is used to burn the effigy of the bad guys. Fireworks are used as celebration, as for Independence Day celebrations on the Fourth of July. In modern times, the fire element has been completely contained and tamed. Something catching fire is usually in a bad connotation, e.g. wild fires that burn whole swathes of dry forests. Only occasionally is ‘catching fire’ used to describe some runaway social success. Children rarely get to experience fire. Fire can be seen mostly as a small contained fire in the stove to provide heat for cooking purposes. The role of fire as a source of light has been completely emasculated and been taken over by electric light. Fire has many other roles too. (See http://en.m.wikipedia.org/wiki/Campfire for a good exposition on what a campfire means). Fire even provides a psychological sense of security. Campfires create a strong sense of bonding. There are very few university campuses that hold bonfires or campfires regularly. It is in this spirit that we created a new tradition of bonfires or campfires at MUM. Initially it started as a bonfire for Holi in March of this year. The response from the campus community was overwhelming. Almost 200 people came and stayed with the fire for hours. One could see the grimaces from snowy cold jacket-grabbing walk spontaneously melting into warm smiles of mysterious exhilaration as they walked from the parking lot towards the campsite and began to experience the warmth of the campfire. Even with snow flurries and an inch of snow accumulated, students wildly sang and danced in the light and warmth of fire for more than 2 hours, till past midnight. We provided some peanuts and sweets to eat. We also provided dry colors to play Holi with. It was a great success. Our head of security organized the fire for us, and he shared something very insightful. He said that we used to have these kinds of events earlier, and there was no student retention problem. So we repeated the experience last August, partly to welcome a new batch of incoming students for the Fall semester. 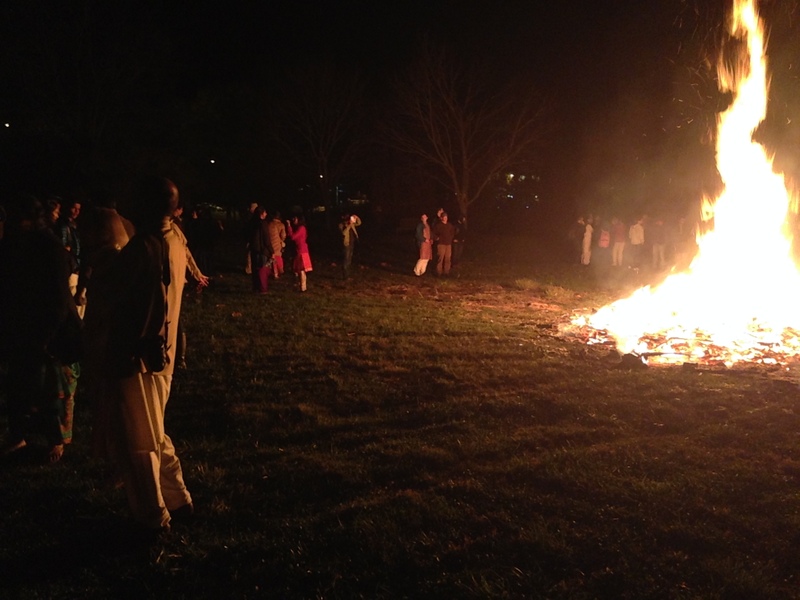 We held a bonfire after a beautiful dance-and-music celebration of Krishna Janamashtmi. The experience was similarly wildly exhilarating. It was not cold outside, and some people earlier wondered if campfire in the summer was a good idea. But the response from the students was overwhelming. They stayed on again till almost midnight. We repeated the experience again this Diwali (celebrated just a few days ago). We had a nice colorful 90-minute song-and-dance celebration in our beautiful spacious auditorium. And then the bonfire was lit at 9:30 pm. Once again a couple of hundred people walked over to the fire. Many newcomers to the bonfire said they had planned to spend just about 5 minutes at the fire just to get a taste of it. But then they stayed on for a couple of hours. They stayed because others were staying on, and it was warm and cosy there to begin with. It was a dark nearly no-moon night but the sky was lit up for us with this fire. As education and learning becomes increasingly online, universities will need to find something special to attract and retain the students. One can create strong bonds with the students in many ways. Holding regular large bonfires is one such way. I recommend it with all my heart! 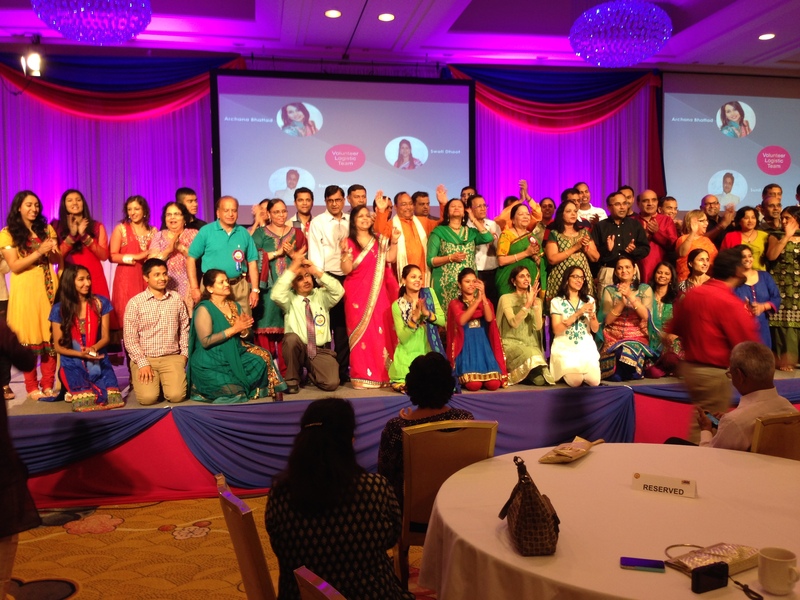 This long Labor Day weekend we attended our Indian ethnic community’s convention in Grand Rapids, Michigan. 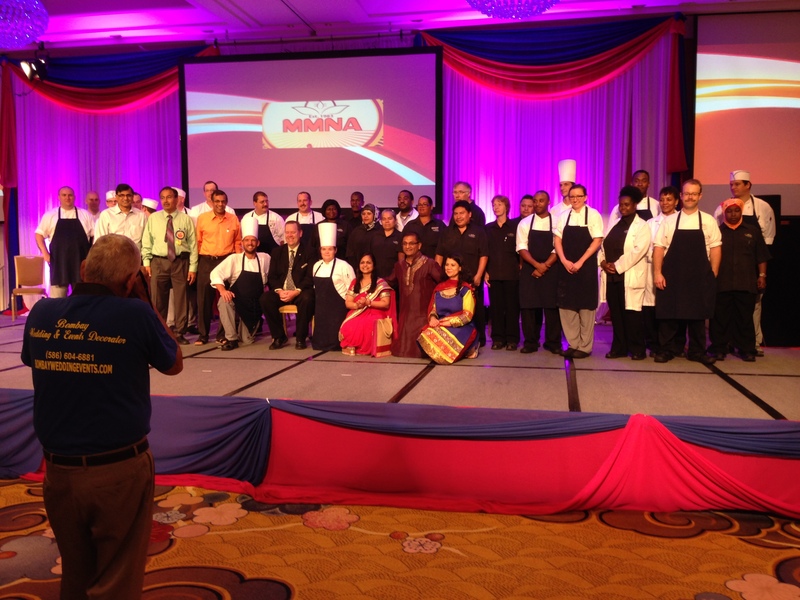 It was a beautiful 3-day affair with over 700 guests visiting from 27 states in the US and Canada, and some from India. This biennial event offered colorful environment, sumptuous food 5 times a day, nice bollywood entertainment, and 52 breakout sessions serving a variety of stuff from Yoga to financial advice to ‘rangoli’ competition. People greatly enjoyed the program and danced their hearts out. More importantly, they rebuilt old relationships and then built some new ones. On the last morning of the event, many people behind the event were being thanked from the stage. A few named leaders were thanked for their vision, commitment and dedication. As is customary, the organizers called all of the almost 100 volunteers to the stage to thank them and take a nice group photo. That was a great moment of cheer. However, the organizers did something even better. They called on stage all the hotel staff which included the servers and the chefs and many others who in their black and gray uniforms worked tirelessly behind the scenes to ensure our every wish was met. Their picture was taken with the leaders of the event. It was a touching moment, at least for me. I don’t recall having ever before seen the hidden army of servers and cleaners being brought to the fore and thanked in such a prominent way. It was the right thing to do. In one stroke it brought cheers to so many undervalued overworked people. By this action, we also taught our younger generation the value of respect for everyone. This is the future of leadership. Everyone who performs their tasks in a conscientious and quality manner should be respected profusely. It does good to the spirit of the individuals, and it also builds a nice culture for the organization. It builds the thickness of connection in society that lubricates collaboration for success in the future.